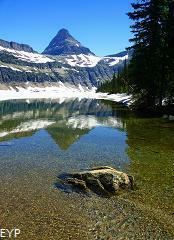 Hidden Lake Overlook, Glacier National Park. 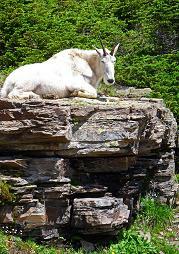 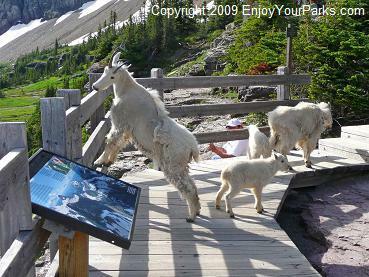 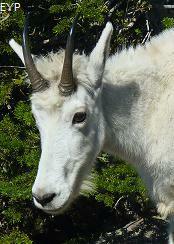 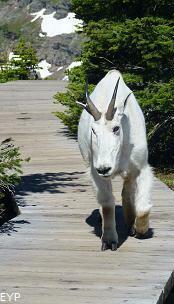 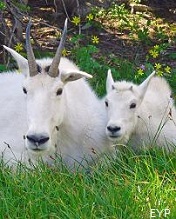 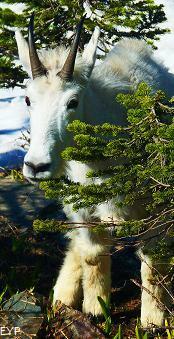 Mountain Goats love to hang out at the Hidden Lake Overlook. 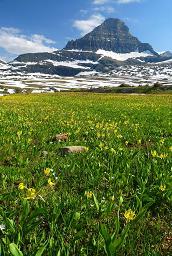 This is one of the most gorgeous 1.5 miles you will ever hike! 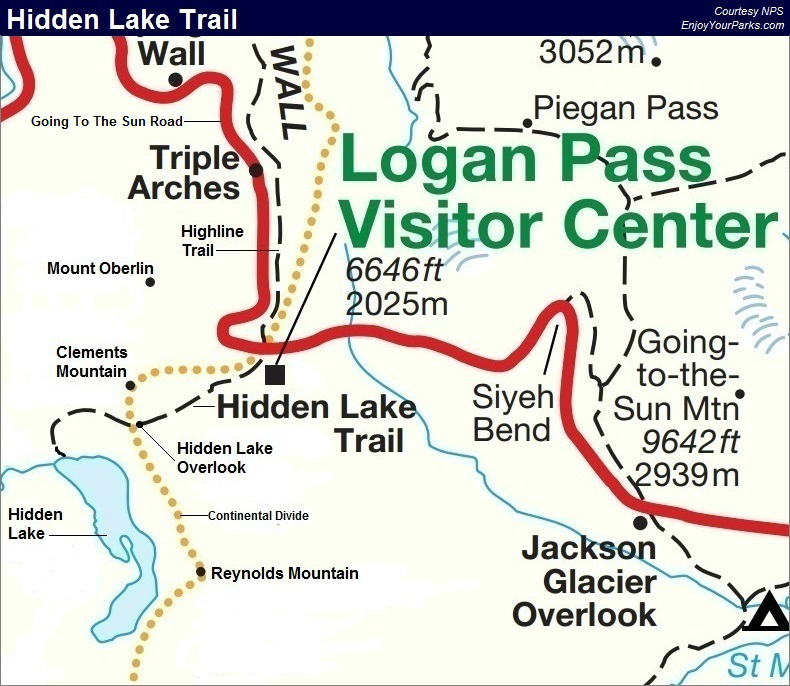 The Hidden Lake Trail is located on top of the continental divide, and it starts at the Logan Pass Visitor Center on the Going to-the-Sun Road. 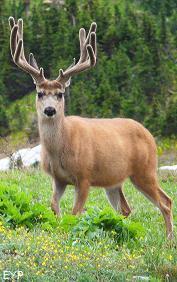 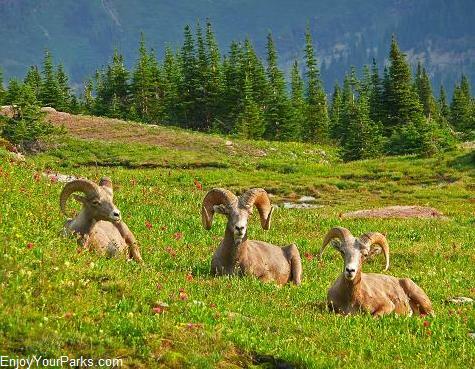 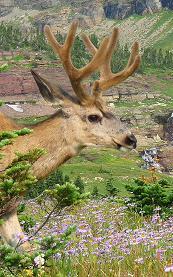 Along the Hidden Lake Trail you will be surrounded by towering peaks, wildflowers, mountain streams, snow fields and wildlife such as Bighorn Sheep, Mountain Goats, Mule Deer, Marmots, and the occasional Grizzly Bear. 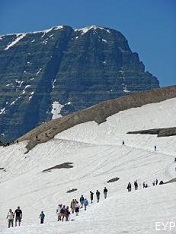 You will be 500 feet above Hidden Lake, and you will get a glimpse of a portion of Sperry Glacier. 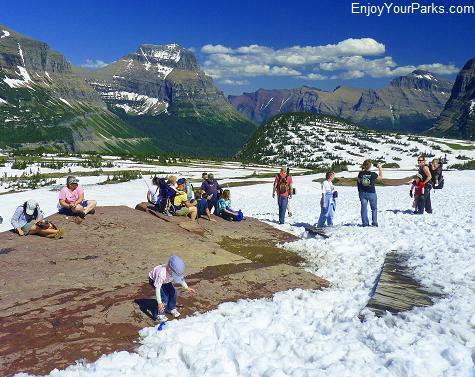 You will feel like you are on top of the world, and you will never forget this day in Glacier National Park! 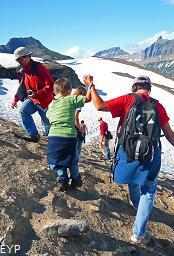 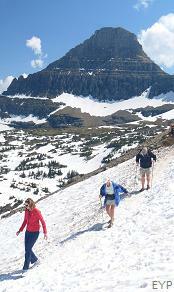 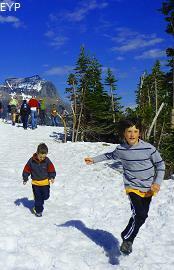 Visitors hiking along the snow-covered Hidden Lake Trail in Glacier Park. 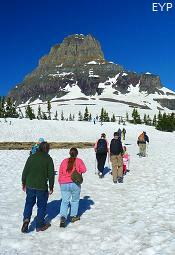 The Hidden Lake Trail is partially a board walk, and the total elevation gained is approximately 460 feet. 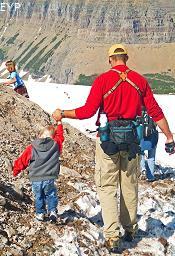 We've seen every walk of life, every size and shape, and every age from 1 to 100 on this amazing walk. 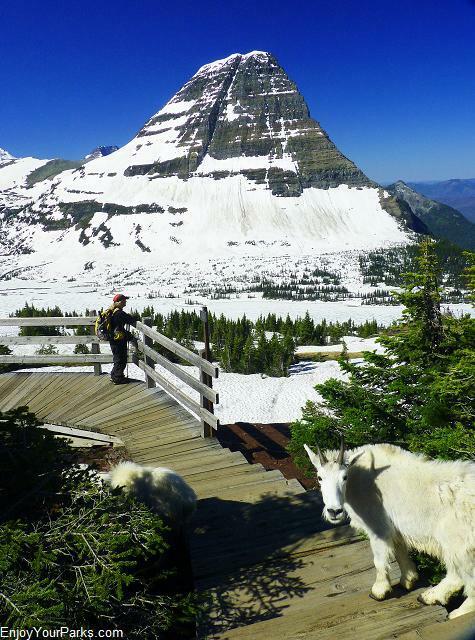 Remember when we talked about Glacier Park inspiring people? 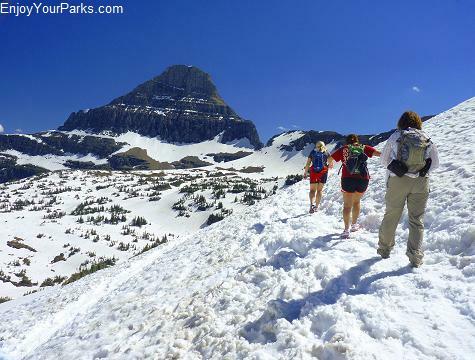 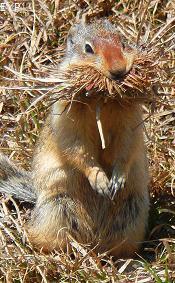 Well, you'll see what we're talking about on this trail! 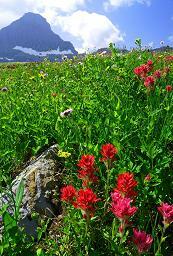 By the way, if you like wild flowers, you've come to the right place! 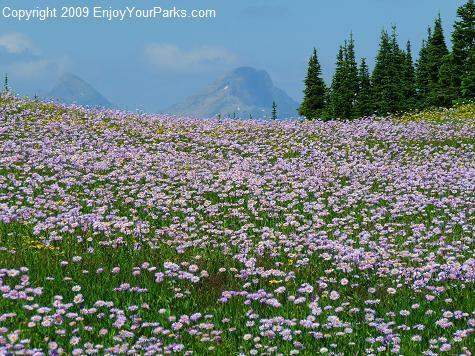 During certain times of the summer, you'll see an OCEAN of wildflowers along the Hidden Lake Trail to the overlook. 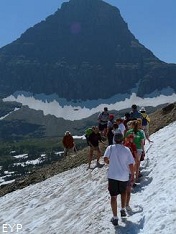 KEEP GOING A LITTLE FURTHER. 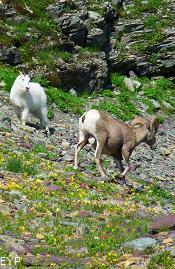 After you've enjoyed the Hidden Lake Overlook, we recommend that you keep heading west on the trail for a few hundred yards because there are often Mountain Goats in this area! 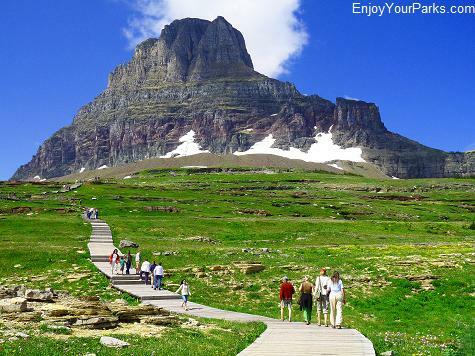 WHAT ABOUT HIKING TO THE LAKE? 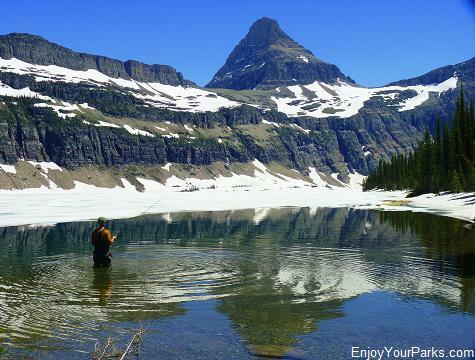 Hidden Lake is beautiful, and there's some nice cutthroat trout too! 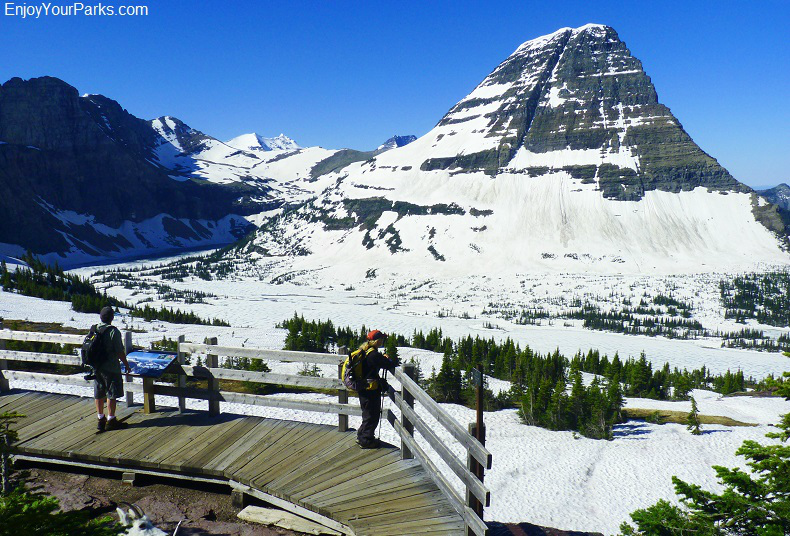 The Hidden Lake Trail keeps going another 1.5 miles beyond the overlook to the shore of Hidden Lake, but you drop about 500 vertical feet to get there. 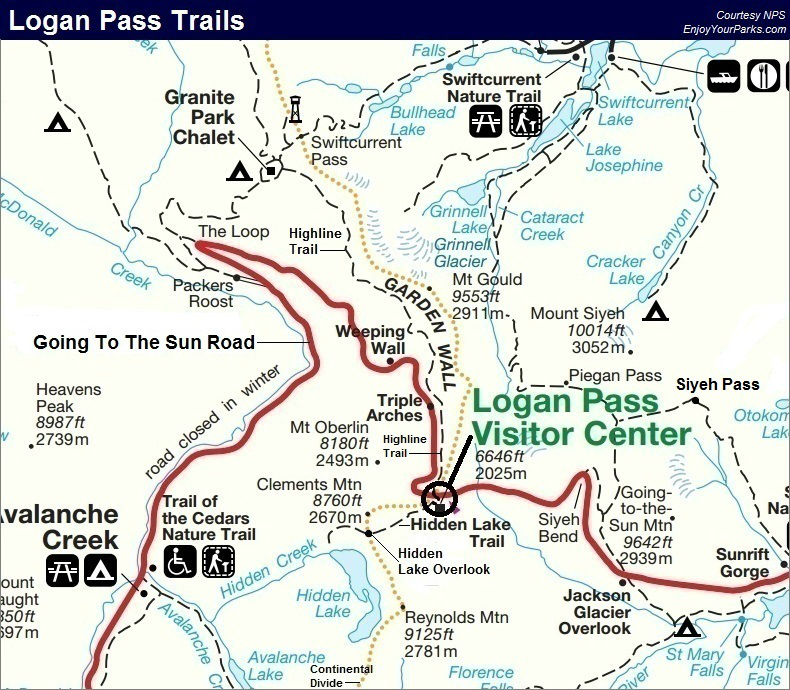 This means you have to then climb up 500 feet to get back to the level trail. 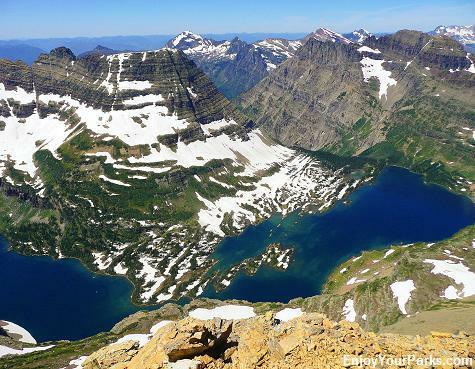 It's gorgeous there, but really the best view is when you're looking down on it. 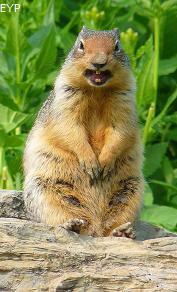 So unless you're in really good shape and really ambitious, you're better off staying on the level. 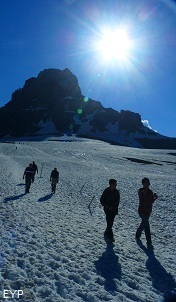 EARLY SUMMER MEANS SNOW FIELDS! 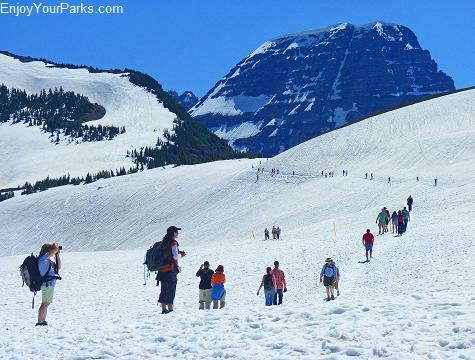 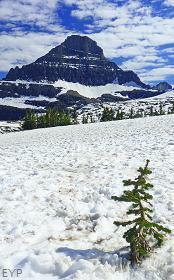 Glacier National Park gets a ton of snow every winter, and this snow can linger on the ground at Logan Pass sometimes through the end of July. 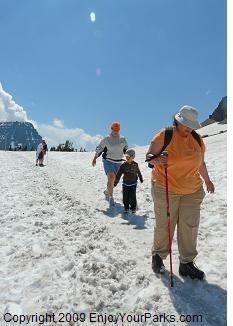 So in early summer, don't be surprised if portions of the Hidden Lake Trail is covered in snow. 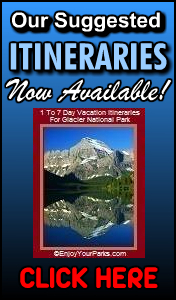 Most visitors LOVE this because it's a blast! 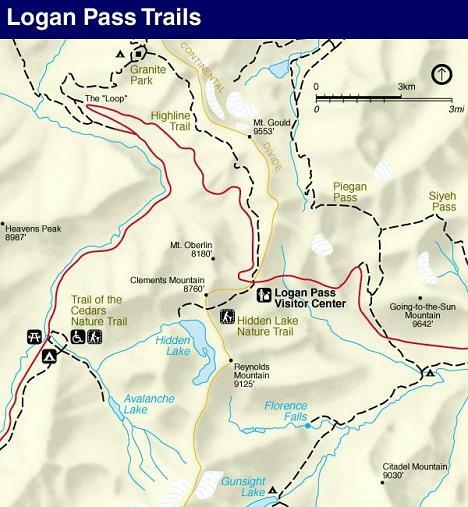 Now be sure to ask the ranger's desk in the Logan Pass Visitor Center on the Going-to-the-Sun Road if there are any parts of the trail that are snow covered, because if there are, wear the appropriate shoes. 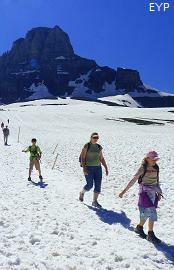 Tennis shoes are fine, but hiking boots or shoes are preferable. 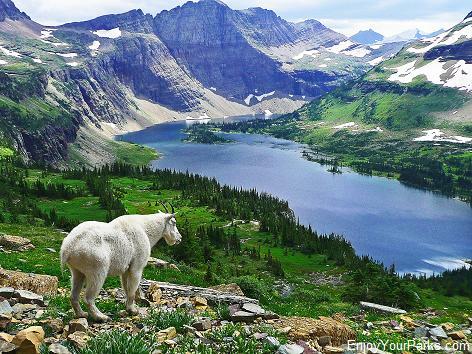 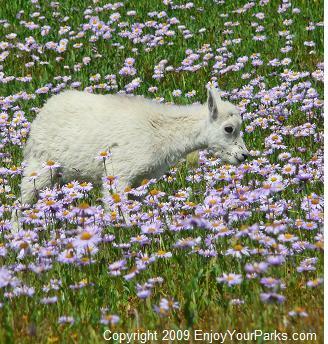 A mountain goat near the Hidden Lake Trail gazes at Hidden Lake in Glacier National Park. 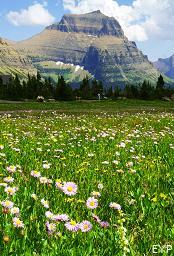 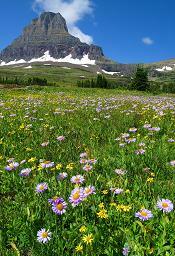 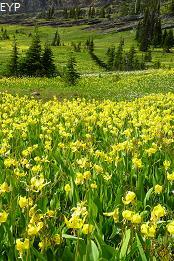 A literal ocean of wildflowers blanket the landscape along the Hidden Lake Trail on Logan Pass (Going-to-the-Sun Road) during certain times of the summer. 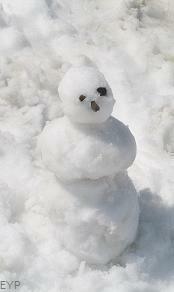 You'll have to see it to believe it! 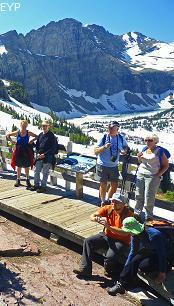 Visitors take a break along the Hidden Lake Overlook Trail in Glacier Park. 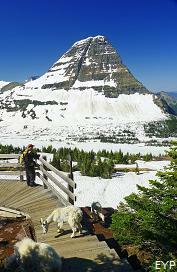 Reynolds Mountain dominates the southern skyline as you work your way up to the Hidden Lake Overlook, Glacier National Park. 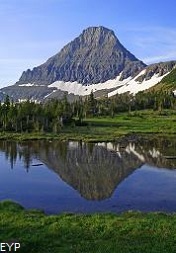 This is a view of Hidden Lake from the summit of Reynolds Mountain. 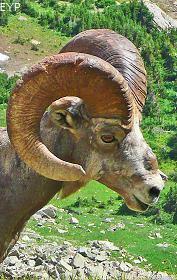 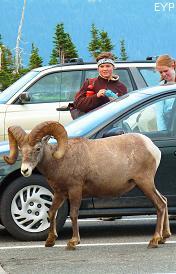 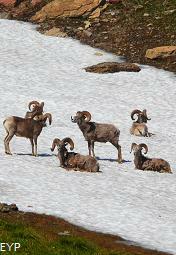 There are a lot of bighorn sheep along the Hidden Lake Trail. 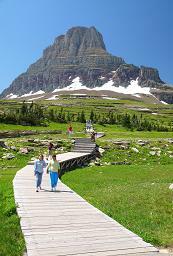 Clements Mountain dominates the western skyline as you begin your hike on the Hidden Lake Trail boardwalk in Glacier National Park.